Ahlstrom Grade 222 is a 100% cotton medium thick chromatography paper with a smooth and uniform texture. It offers extremely high flow and is recommended for both electrophoresis of large molecules and as a blotter to complete the blotting sandwich in gel transfer applications. Thickness: 0.83 mm. Absorption speed: 220 mm / 30 min. Ahlstrom manufactures a complete line of high quality chromatography electrophoresis and blotting papers for use in gel transfer applications and chromatography techniques. These uniform smooth white sheets are the high purity high quality and high value standard. They are used in nucleic acid research such as Southern Northern and Western blots electroblotting and electrophoresis. 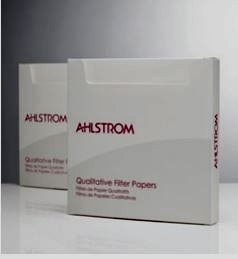 Ahlstrom chromatography electrophoresis and blotting papers are made from high purity and 100% FDA compliant alpha cotton cellulose using ultra-pure RO water and contain no additives that could cause increased backgrounds or other interference in detection systems.